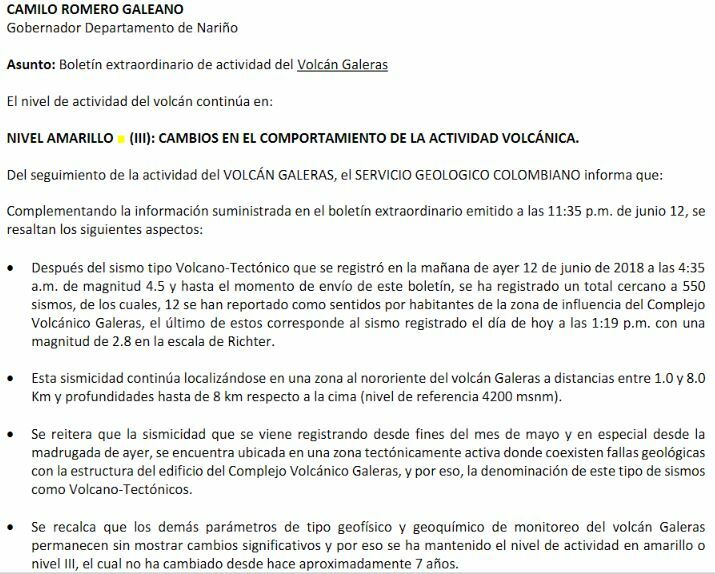 The Galeras Volcano in southern Colombia registered two moderate volcanic earthquakes on Tuesday, June 12, 2018, that left two people dead as well as several homes and roadways damaged. 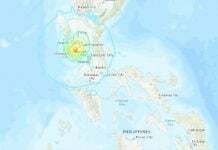 Since then, more than 550 earthquakes have already hit the same area. Authorities are now on high-alert and have activated all protocols in case of an emergency. Galeras is Colombia’s most active volcano. 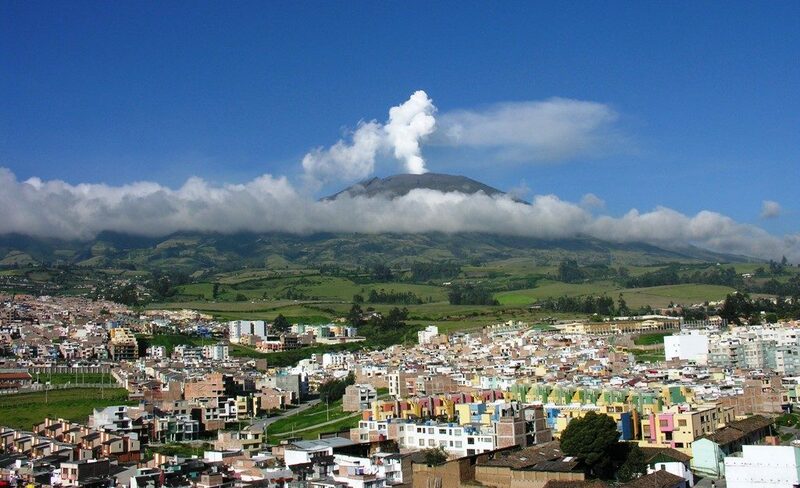 The last eruption of the Colombian volcano was in January 2010, when some 8,000 people were evacuated. 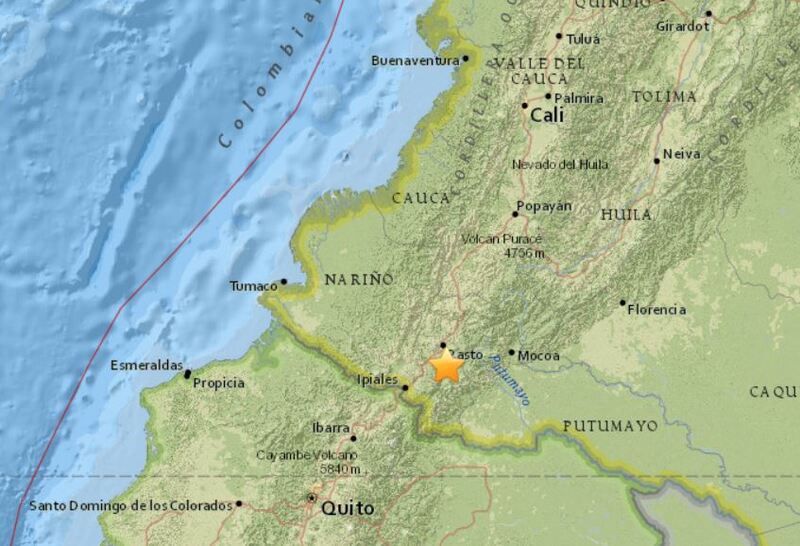 These two volcanic earthquakes have placed local authorities in the nearby city of Pasto, capital of Narino Province, on high alert.”We have activated all of the protocols …to attend to the emergency,” Narino Governor Camilo Romero said on Twitter. Officials haven’t change the volcano alert level and don’t think this swarm of 260 earthquakes is a prelude to another eruption of the volcanic peak. 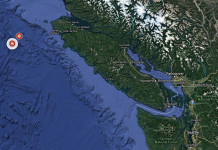 The two people died when their house was crushed by falling rocks. Officials suspended classes in local schools as a precaution. he last official eruption of the Galeras Volcano in Colombia was reported in 2010. Galeras is Colombia’s most active volcano. Its last eruption was in January 2010, when some 8,000 people were evacuated. Wow! This is a great destruction by a tornado in Pennsylvania. In Pennsylvania, just like Transylvania in Romania, there are huge population of vampires (=blood sucking reptilians). 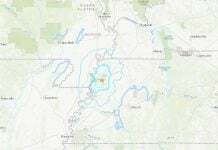 This is the area the tornado made a great damage on Google Map. Another video shows from different angles of the tornado damage. Oh, my god! This video is awesome. It is still only 15% contained. Look at this huge reptilian (vampire) structure burning. Look at antenna array at 5:13 on top of the mountain behind the fire fighter watering on this video. Where antenna array is, where reptilian secret underground base is. This was not arson, but this was cleaning operation by Galactic Federation of Light. What kind of meat this burnt restaurant should had been cooking? A girl abducted by reptilians living in a cave found in the deep underground cave. Of course, she did not have a flash light. She come from some other country, and could not speak or understand English. The cave where a girl found was APE CAVE, Washington, just south of Mt. St. Helens. All the cave systems all over the world are part of the reptilian secret underground systems. Many of them had been built in ancient times when many human eater aliens (reptilian aliens) were here. Right now, many of them had left from the Earth, but still there are many here (about 15% of whole population with RH negative blood type = Royal blue blood). I myself went to Walmart at 4 am when I used to live in Clearwater, Florida. When I arrived Walmart in Clearwater beside US19 Highway, I realized there were only several cars parked in the huge parking lot. I was sure that this Walmart was 24/356 operation that means it never closes. But I was not sure when I saw only several cars on the huge parking lot. When I stand in front of the door, the door opened, and it was open. When I entered the store, I was surprised that more than 200 employees were busy putting inventories on the shelves. Then I wondered where these employees had come from. Outside on the parking lot, I could find only several cars. Then I reminded that I saw the information about the underground tunnels under major Walmart stores. I realized that those more than 200 employees were from underground cities commuting by underground tunnel train systems just under the Walmart.